The Calypso Tandem is the newest addition to the Kiwi Clear Kayak family. It was designed primarily for the resort and commercial markets. 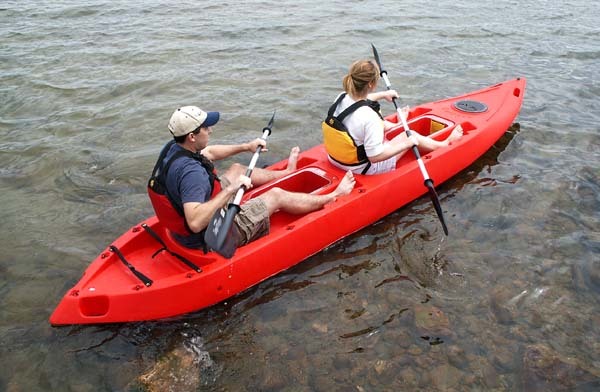 It is more of a traditional sit-on-top kayak, while still offering the ability to view the underwater world through two clear inserts. Safe, durable and responsive, the Calypso comes with many standard features which we're sure you will enjoy for many years to come. Clearly Different ® is a registered trademark of Baywood Enterprises, number 78100102. Kiwi Clear Kayaks are protected by US Patents 6,394,020 and 6,745,716 and 7,021,234.